I learned a lot from this exercise! Alan November’s article was an important reminder to me that teachers should help students answer their questions about different viewpoints on events by teaching them to develop good search terms. Also, the Bynd.com article about advanced Google searches introduced me to many search terms that were new to me. I took some time to develop a three-page table that shows the terms and descriptions mentioned in these two sources. Upon request, I’ll gladly send anyone a copy by email. If in coming days I find out how to add a free-standing page of resources to my website, I’ll include a link to this document in pdf format. By a circuitous route from the search term site:edu ca servant leadership on Google–Videos, I landed on a video and a book I didn’t know existed. 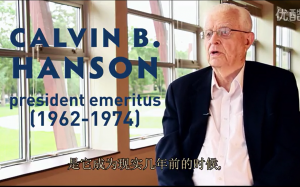 The video promotes the TWU Mandarin MA in Leadership Program. Not surprisingly, YouTube introduces the video with Chinese commercials! The first speaker on the video is Calvin Hanson. Calvin B. Hanson (1926-2013), TWU President from 1962 when it was founded as Trinity Junior College until 1974, and President Emeritus from 2006 until his death in 2013. In 2010 I had the exciting experience of visiting Dr. Hanson and his wife Muriel in their home just north of Bellingham to evaluate a vintage pump organ which they wanted to give to a good home. They had found out about my expertise with vintage musical instruments from my website. The screenshot of Dr. Hanson comes from the video. 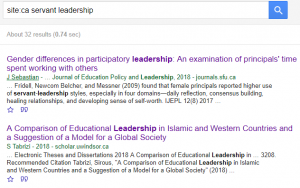 Then I opened site:ca servant leadership in Google Scholar–before 2014. This search results in over 1,400 articles, so I narrowed it further by going to before 2018, which shows 33 articles. The top ones are shown in the screenshot. My wife and I both love classical choral music, and we often enjoy Minnesota Symphony concerts. While living in Washington State from 1991 to 2012 we sang with the Pullman-Moscow Community Choir and with the Whatcom Chorale. Indeed, while completing this assignment, I’m listening to the Minnesota Public Radio choral music broadcast. 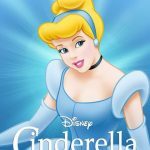 Perusing the listening schedule, I noticed the podcast link for a childhood favorite–Cinderella. In coming weeks I do hope to learn how to install a podcast player on my website!